Proximity wingsuit flying involves donning a state-of-the-art Teflon winged suit, jumping out of a helicopter or off a cliff edge thousands of feet up and flying terrifyingly close to some of the world's most dangerous mountain faces before pulling a parachute at the very last minute. It is the closest man has ever got to his ancient dream of flight and it is extremely dangerous. One mistake can lead to instant death. In sub zero temperatures 200 miles north of the Arctic Circle, Dutch Daredevil Wim Hof attempts to run a full 26-mile marathon clad only in shorts and a pair of sandals. Hof currently holds nine world records for exposure to extreme cold, but this awe inspiring act of endurance surpasses all his previous adventures. Exposing the body to temperatures of -25C for more than four hours is an extraordinary challenge, one which experts fear is beyond the capabilities of human beings. This film follows Wim's preparations in Amsterdam, which include taking midnight dips in freezing canals and meditating in a meat freezer. It also examines how Wim's extreme behaviour impacts upon his family life. Tensions run high as Wim and family head north for the marathon. Everyone is aware that with this challenge Wim is taking on a level of exposure to cold far in excess of anything he has ever previously attempted. He is a Daredevil venturing forth into the extreme unknown. Dean Potter is the only person in the world who does extreme slack-lining. This hair-raising variation of tightrope-walking finds Dean high in the sky, crossing a bouncy, one-inch-thick stretch of rope without using either a pole for balance, or any kind of safety harness. Dean has 'slack-lined' across some of the world's most breathtaking canyons, suspended hundreds of feet above the ground. One slip could see him plunge to his death. This nail-biting film follows Dean as he prepares for his bid to complete the longest high-line crossing ever, and, by doing so, cement his reputation as one of extreme sport's greats. Alain Robert is known to the world as `The Human Spider' and is arguably the most daring climber the world has ever seen. This film follows Alain over two years, bringing his story up to date with new, behind-the-scenes footage revealing his assault upon the one building that has eluded him time and again, the Petronas Towers in Malaysia. Watch Alain as he takes on the 88-storey edifice with just his bare hands, some chalk dust, and an awful lot of nerve. Alain's attempts to 'free climb' up the outside of some of the world's tallest buildings and structures without any safety equipment have earned him a reputation as one of the world's greatest Daredevils. Despite suffering from epilepsy and admitting to a fear of heights, Alain Robert has made headlines around the world with his unbelievable feats of daring. The 47-year-old husband and father-of-three has scaled skyscrapers such as the Jin Mao Tower in Shanghai, Berlin's Debis Tower, and the Federation Tower in Moscow, Europe's tallest building. This heart-stopping documentary also features revealing interviews with Alain's family in an attempt to understand what motivates him to repeatedly risk his life. From London to Timbuktu inventor Gilo Cardozo risks his neck testing his latest invention, the world's first ever practical flying car. Gilo was last seen flying a motorised paraglider over Mount Everest with Bear Grylls. This time he teams up with seasoned adventurer and former SAS soldier Neil Laughton. The British duo plan to both drive and fly from London to Timbuktu. It's an ambitious undertaking and the pair are on a pretty tight deadline. 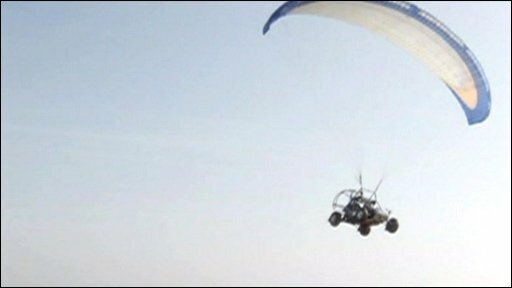 On the eve of their departure, and in front of the world's press, they are forced into an embarrassing admission: that not only has their practical flying car not been tested to any height, but the Civil Aviation Authority has decided not to allow them to fly anywhere in British skies. And so they must resort to using the Channel ferry to get them across to France. But there are sterner tests ahead for the intrepid pair. How on earth will they cross the Straits of Gibraltar, or the vast expanse of the Sahara desert? And will they make it to Timbuktu?